Has incumbent “kindness” suppressed the fintech revolution? “No one joins a revolution merely to optimise costs.” That’s one of several points made in an excellent new report by the British arm of Accenture (which explains the spelling of “optimize”). The report’s title raises another good one: Did someone cancel the fintech revolution? Although confined to the UK, the report’s conclusions are applicable to the US, as many of the same forces are at play. And although it doesn’t answer the question, it notes that fintech hasn’t yet lived up to its promise to “contribute meaningfully to productivity.” True, regulatory burdens are high, customer acquisition is costly and building profitable business lines is brutally hard, even without Google, Amazon and Facebook lurking. But another explanation for fintech’s “disappointment” thus far ─ which the report doesn’t emphasize ─ is co-option. As anyone who follows fintech knows, incumbents have done a 180 in their engagement with fintechs, smartly switching from frigidity to friendliness and more within a few years. That “more” has effectively given many formerly combative outsiders a warm meal and the cozy blanket of security that comes from collaborating with giant institutions. But that paternalistic support may well prove smothering to many would-be disruptors. Should we, therefore, change our name to “The Financial Evolutionist” (which has a nice ring to it) to reflect the current state of affairs? No. A hudna isn’t meant to last forever, but for now, Accenture is right to question the revolution. Because coziness and coup d’etats just don’t mix. 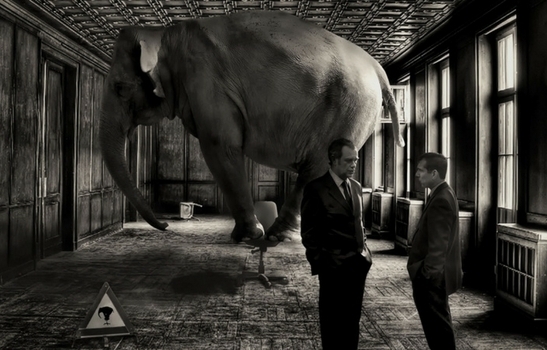 Hoffman, Andreessen and the financial elephant in the room. This week’s most important discussion involving the future of financial services occurred between two tech titans on stage with a well-known media personality. The panelists, Reid Hoffman and Marc Andreessen, were expertly egged on by Recode’s Kara Swisher. And like those masterful Japanese fishmongers skilled in the art of Ikejime, Hoffman and Andreessen carved up huge swaths of the American economy with aplomb. Of course, their industry assessments could be dead wrong, but we particularly liked the logic behind Andreessen's vision of the economy, which has two main buckets: fast-changing industries (i.e., media, retail, transportation) where tech has had a huge impact on productivity and cost curves, and slow-change sectors (i.e., health care, construction, education), where there’s been little productivity growth thanks to regulation and high barriers to entry. Interestingly, neither panelist mentioned financial services, which accounts for eight to 10 percent of the US economy. Perhaps that’s because financial services don’t fit neatly into either category. After all, government regulation is high, but so too is tech investment. Or maybe it’s because the relationship that individuals, businesses and institutions have to their money is unlike anything else. Either way, we couldn’t help thinking that both panelists were offering cogent points about the future of finance, even if its name wasn’t uttered. She’s never written code and hasn’t had an exit; however, when it comes to being a disruptor, Sister Nora Nash of Sisters of St. Francis exemplifies the entrepreneurial spirit. That’s because this week, Nash outmaneuvered one of the world’s behemoths: ExxonMobil. Thanks in part to her leadership, 62 percent of ExxonMobil’s shareholders approved a measure that calls on the company to provide greater transparency on the risks it could face as a result of greenhouse-gas emissions. During the same week in which President Trump fired the Paris Climate Accords, the victory over ExxonMobil, which rarely loses proxy resolutions (and actually supported the Paris Climate Accord), offered a silver lining to those angered/saddened by Trump’s choice. It should also be noted that Nash’s victory couldn’t have happened without the support of the ETF/Index world’s “Big Three”: Vanguard, BlackRock and State Street, who likely sided with her. Still, it was Nash who paved the way for the fund houses to flex their muscles in support of a principled stance. That might be useful for Tim Cook and/or Elon Musk to keep in mind for the next time they have a board seat opening. Are ICOs BAT s#*t crazy? “Venture capital is an industry that invests in technology and internet, and it benefited greatly. But how has it evolved in the last fifty years? It hasn’t.” The alternative model being advanced is the initial coin offering, and the commenter, Blockchain Capital’s Brock Pierce, has been a champion of the surging ICO market. A notable example: this week, Brave Software (a former Company of Note) raised $35 million in 30 seconds via 130 investors who bought “Basic Attention Tokens,” or BATs. Crazy? Perhaps, but to be fair, Brave’s Software CEO, Brendan Eich, is the real deal, and his company has secured institutional funding previously. Still, we expect that that fervor will fade as greater understanding and token supply follows. We also think it’s way too soon to say that VCs will be buggy whipped out of existence. But it’s hard to refute the irony that VCs haven’t always eaten their own cooking. Perhaps ICOs will put them on notice. Here’s investing star Steve Cohen on Steve Cohen: "There may be firms out there that are happy being middle-of-the-pack and having modest returns, and maybe don’t work as hard as other people and are perfectly acceptable. That’s not me.” This week, we got a new glimpse of Cohen’s determination in The Wall Street Journal, which indicated that he’s planning the largest hedge fund launch in history next year. That new fund will likely include lots of personnel from his existing investment entities, Point72 Asset Management and Stamford Harbor Capital. It’s also likely to be infused with insights and IP that he’s gained from his investech activities, which include Point72 Ventures’ equity stakes in start-ups including Quantopian, Street Contxt and Acorns. Those distinguished innovators may serve Cohen well in his new war against mediocrity. Is your financial innovation message boring? Woody and Buzz Lightyear’s cautionary M&A tale. In the past, we’ve been supportive of transactions like First Data’s recently announced acquisition of Card Connect. But since many deals don’t work out as planned, we’re noting a particularly interesting case study on how Disney botched the post-acquisition of Pixar Studios, formerly the world’s best animation company. The takeaways will be familiar to those conversant in M&A, but perhaps in recalling Pixar’s legendary films such as Up and Toy Story, the Pixar acquisition will serve as an effective reminder that even the Magic Kingdom can kill a start-up’s magic. There’s a lot to like about Likefolio, a Louisville-based, self-funded investech start-up founded by brothers Andy and Landon Swan. There’s no shortage of social media scraping services in the marketplace, but Likefolio offers a few key differences. First, rather than focusing on the Twitter cashtags of public stocks (e.g., $AAPL or $SBUX), the company emphasizes keywords associated with America’s best known brands (e.g., "iPhone" or "frappuccino"). Doing so facilitates a much richer stream of data that investors ─ institutional and retail, quant and fundamental ─ can use in their analysis. In addition, Likefolio has meticulously constructed a full taxonomy of products to companies that is continuously updated via its proprietary technology. That brand-mapping database, which can be accessed through Likefolio’s API or customized research reports, covers every consumer-facing company in the S&P 500. “Using our database, our clients can unearth sources of signal that exist far beneath the surface,“ said Landon Swan.